As a part of goodwill gesture and to build a friendly relation between two border guarding forces, the Border Security Force (BSF) and the Border Guard Bangladesh (BGB), a group of 23 school children along with officials left for Bangladesh through ICP Dawki on 27th Jan’ 0900 hrs. This is a four days tour programme of school children visiting Bangladesh from 27th to 30th Jan’2017. During tour the students will visit important places such as educational institutions, natural beauties, museums and historical places in Bangladesh. The main motive behind the visit is to get students well acquainted with socio-culture, education as well to develop social harmony with the neighbouring country. This visit will definitely enable Indian students to know about rich cultural heritage of Bangladesh. Short visits by individual child or group of students to another state will certainly encourages them to know about foreign culture by artistic and cultural activities. A Group of BGB school children has already visited Meghalaya, India in month of October 2016. Such programme of student’s interaction will go a long way in further building up the cordial relationship between the two friendly countries and their young generation. PK. 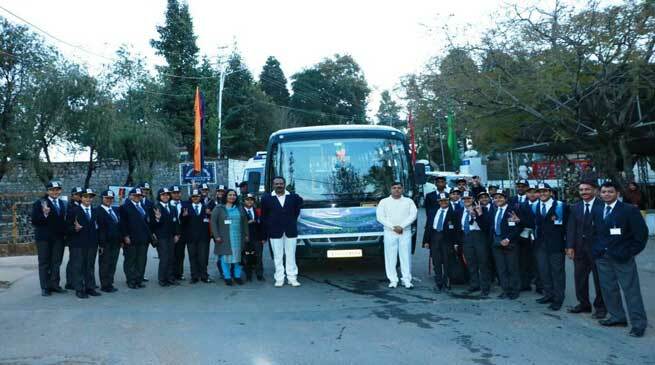 Dubey, Inspector General flagged off the bus carrying these school children from BSF School at Ftr HQ BSF Umpling. He conveyed his best wishes to each one of the visitors.